It’s the latest craze and, like most crazes, it has its supporters and its detractors. 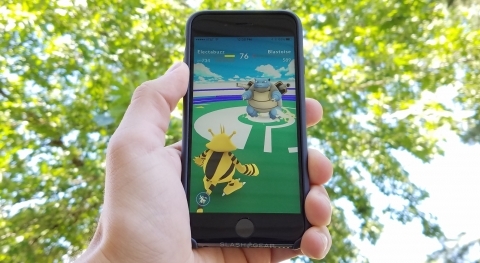 Pokemon GO has become one of the most popular games ever, but don’t dismiss it as some silly game too quickly, it can have some real benefits for your child. The most obvious benefit is the exercise your child will get as they walk around looking for Pokemon. They may even take the longer route voluntarily to notch up the extra distance it takes to hatch any eggs they might have in an incubator; each egg requires the phone to move at walking pace for a distance of two, five or ten miles to hatch. This exercise will help strengthen their muscles and bones, build their stamina and cardiovascular health as well as helping to improve their appetite and sleep patterns. Throwing the balls on the screen will improve your child’s hand-eye coordination as well as exercising the finger, hand and arm muscles. This is very important for fine tuning motor control skills like writing or doing up buttons. You can catch more Pokemon if you work together and your child will learn to share information, negotiate tactics and manage conflict when views differ. Shyer children find it easier to talk to others about a common interest that doesn’t make them the center of conversation. It’s a good way to learn to value the skills and knowledge of others as more experienced players teach novices the tricks of the game. There’s an element of competition as players choose which team they support, but this tends to encourage team spirit and friendly rivalry rather than anything more negative. Haying Pokemon GO will give your child the opportunity to develop their planning and organizing skills as well as learning to manage resources as they choose when to use the various items they’ve been given to get the highest score. They’ll be faced with decisions and need to solve problems like how to locate a Pokemon and best to trap it. They’ll learn about distance, direction and how to read a simple map. Pokestops, where they can collect items are linked to places of interest and it’s a good opportunity to talk to them about local history or important events. They’ll be exposed to scientific concepts ranging from angles and trajectory to evolution. Their focus and concentration will get better and they’ll learn to ignore distractions which will prove useful in an academic environment. Their memory will also improve as they gather information, on everything from the best tactics to use for a particular Pokemon to which ones they most want to catch, storing and retrieving it for later use. Math skills will get a workout as your child calculates scores, how much they need to get to the next level, how many candies they need to make a Pokemon evolve and when’s the best time to use their lucky egg. Having a shared interest with others will encourage your child to talk to a range of people, sharing ideas, explaining what they’re doing and describing both abstract and concrete concepts. Their confidence will increase and they’ll get more practiced in the non-verbal elements of communication that hold so much of the message. There are plenty of stories in the social media about people being hurt as they hunt Pokemon, but there are some simple steps you can take to make sure your children are site. All the warnings in the world are not going to stop them from being oblivious to the world around them at some point, but making sure they travel in groups and having a marshal, a non-player dedicated to keeping an eye out for hazards like traffic or unsafe areas, will help prevent accidents. Reinforcing the need to be aware of stranger danger is important as are the potential risks of looking for Pokemon in secluded areas; it’s possible to set up a lure in the game to attract Pokemon, and players, so make sure they know to stick to well-populated areas. You may want to introduce other safety measures such as setting a geographical limit to how far they can travel. You can encourage them to check in with you at set times by getting them to report their catches to you; you could keep a scoreboard with a small prize for the most Pokemon or most unusual catch. A Pokemon hunting pack containing water, slacks and sun block can reduce the rick of sunburn and dehydration. Pokemon GO might only be a short-lived obsession, but it’s one you can take advantage of for the potential long-temp benefits. The question is, are you going to join the quest as well?